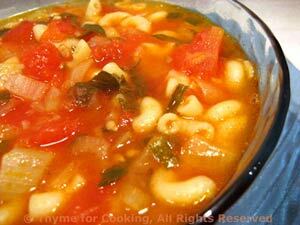 Tomato and Cannellini Soup, Thyme for Cooking late summer soups. A quick and easy soup for a first course, with lots of summer flavor for a winter soup. Finely chop onion, garlic and celery. Sauté onion, garlic, celery in medium saucepan in olive oil over medium heat until soft and transparent, 7 - 10 minutes. Drain and rinse beans (refrigerate what is not used). Add tomatoes, all of their juices, chicken stock, beans, herbs and pasta to saucepan. Cover and simmer over low heat for about 20 minutes, stirring often so pasta doesn't stick.